On a Sunday afternoon I walked into the restaurant Taiyo Ramen, which is across the street from The Lakes shopping complex. On the left there was a wall of bowls forming a wave-like image and on the right a wall of mirrors to open up the small space. In front of me was three TVs, one playing football and two playing anime. Overall, I feel that the “look” of the place was very appealing, but not really authentic to what I would expect a ramen place to look like. Since I went during a time is wasn’t busy, the place was quite empty and there was not any customers around. However, I also went on a Friday night and the place was completely packed. Like I said before, the space was small, so when it was full it just felt smaller. Though the place was full, it didn’t stop the restaurant from providing great service. I only waited for ten minutes on a busy day, and 7 minutes on the day that it was empty. So their service, at least to me, was very efficient. Next, I would like to talk about the food. When I went on Sunday I bought two things: Spicy Tuna Over Rice and Miso Tonkotsu (Pork) Ramen. The Spicy Tuna Over Rice was just like it sounds, raw spicy tuna on top of plain rice. Personally, I didn’t like it was much as my sister and my mother did when we went. However, in hindsight I don’t even like spicy tuna, so I feel that if you like spicy tuna sushi you will really like the Spicy Tuna Over Rice. Another part of the restaurant that I found intriguing was the snacks in the front of the room. When I entered the restaurant I really wanted to eat them, however, by the time I had finished my meal I was so full I could barely look at them. So though having them is somewhat a good idea, I don’t think people will be buying them that often. Finally, let’s talk about the ramen. The options that are given include Tonkatsu (Pork), Chicken and Veggie. The soup can be either Shoyu (Soy Sauce), Miso or Spicy Miso. I choose the Miso Tonkotsu Ramen and it came with both good and, a few, bad things. Personally, I thought that the meat was somewhat lacking flavor and there was a bit too much green onion in the soup. However, these small faults didn’t really affect the overall quality of the ramen. The noodles were much thicker than a typical Top Ramen and absorbed most of the flavor. They were the best part of the ramen. The next best feature was the egg, it was cooked to be soft-boiled and contained a runny yolk, which made the ramen even more delicious. Overall, the restaurant is inviting and the small space doesn’t limit your experience. 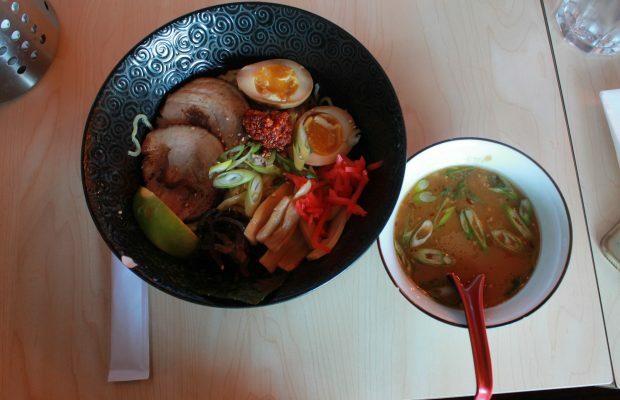 Taiyo Ramen is a great local restaurant to begin your ramen experience.